When I met the bride and groom and the mention that they will get married at Chateau Le Parc, they also told me they wanted lots of pictures of the bride and groom's accessories ranging from the rings to shoes, garter, invitations, watches and so on. As wedding photographer, I learned that making my clients happy is more important than my personal opinions on a particular photograph or shooting style. To me, on a big day, photos of family and guests should be more important than those of the wedding venue decorations. However, I was not the one getting married so I listened carefully to the couple and prepared to over deliver the most beautiful images they have ever seen. At the beginning of my career as a Toronto wedding photographer, I always want to know the settings and how a particular image was created on the big day. Sure, there are a few shots you cannot replicate because the emotions are just not there but in general, when it comes to immovable objects, a professional photographer can mimic the seal, lighting, backdrop and so on. To start with, I placed the beautiful bride shoes behind the rings to create a more interesting backdrop. The bokeh caused by the shiny Badgley Miskha shoes is just spectacular. 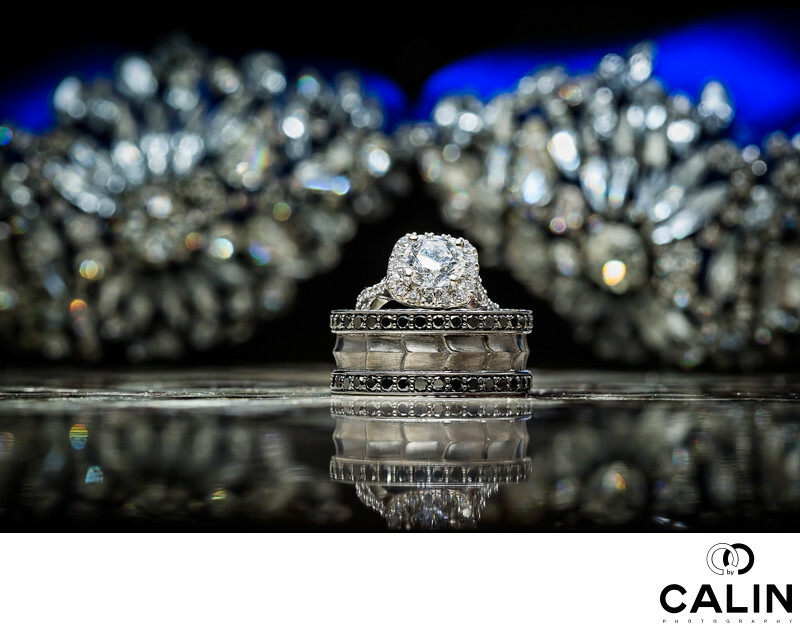 In the foreground, I placed the wedding bands on a reflective surface. The engagement ring dominates the whole scene. To be able to shoots very close to the subjects (the rings) I used a Canon 100 mm f2.8 L macro mounted on a 5D Mark three camera. I know that wedding photography is not about the equipment to use and more about emotions and moments but the sharpness and image quality of this particular lens is out of this world. Capturing the love story between the bride and groom and delivering splendid detail shots to the couple allowed me to receive more business after this special event.